Published: Watson, Virginia. With Cortes the Conqueror. Philadelphia: The Penn Publishing Company, 1917: 11. ______. New York: The Hampton Publishing Company, 1917: 11. Commentary: The size given is the view. 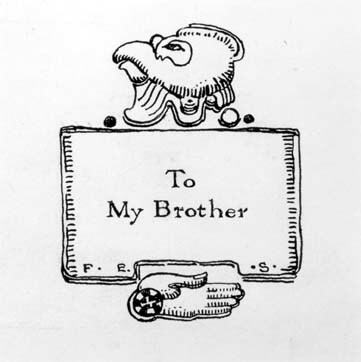 The phrase “To My Brother” does not appear as part of this design in either of the publications. It was either added afterward by the artist, or taken out by the publisher.